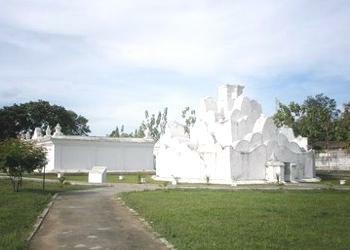 Gunongan had erected by Sultan Iskandar Muda (1607 - 36) as a private playground and bathing place for this wife Putro Phang (From Malaysia). This whimsical architectural fantasy had access to the sultan's palace through the traditional 'Pintu Aceh', used by royalty only. This building likely functioned as an important recreational peace located in the Taman Sari Park for the Queen and other royal family members to climb. It is quite enjoyable to visit this place during the late afternoon or sunset. Structure's history and power of love is a symbol of the Sultan Iskandar Muda to the beautiful queen, Princess Phang (Phang Putroe) derived from Pahang, Malaysia. Once, Putroe Phang often feel lonely in the middle of the husband as head of government. He always remembered by his hometown in Pahang. The husband understand the anxiety empress. To please the empress, he built a small mountain (structure's history) as a miniature hills that surround the palace Putroe Phang in Pahang. Once the structure's history is built, how happy the consort. Spent his days playing with a lot of ladies in waiting around structure's history, as he climbed up. Structure's history is located at Jalan Teuku Umara dealing with the location of graveyard Dutch soldiers (Kerkoff). The building was founded in the reign of Sultan Iskandar Muda (1607-1636) in the 17th century. Building structure's history is not too large, hexagonal, shaped like a flower and a three-story with main level of a crown pillar that stands upright. On the walls there is a low-sized entrance which is always in a locked state. From the hallway door is a staircase leading to third level structure's history.